A podcast about all things Macintosh. For Mac geeks, by Mac geeks. Special edition of the MacCast where we discuss Apple’s design history. This is the first in what I hope may become a series I do with my good friend Victor Cajiao from Typical Mac User and Immigration Tales. Victor and I take a look at how Apple’s ideas about design began and how their design language and philosophy shaped their products through the years. It was a lot of fun and I hope you enjoy it as much as we did. When you received your new Mac it included iChat which you could use to connect to AOL’s Instant Messenger service. iChat is a fine application and particularly useful for video chats, but in this article I am going to try and talk you out of using it for normal text based chats and talk you into switching to the free application Adium. If you have a number of people that you chat with (I have around 100 people in my buddy list) then I find the Adium a more efficient display. You do give up seeing the current icon for people but most people I know have the same icon day after day. iChat supports groups as does Adium but if you only want to see the people who are online and use groups in iChat you can have all of the friends who are offline moved to a Offline friends group. 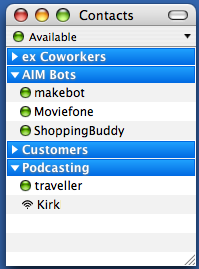 Adium allows you to group your buddies and also show or not show offline buddies completely independently. New iPod for the Holidays? Here’s your iTunes Guide. So you just bought your parents or significant other a shiny new iPod for the holidays. Great, but now your ears are burning with questions like, “How do get my CDs on this thing?” or “Why are my favorite playlists not syncing?” or “How can I subscribe to this podast?”. Well don’t worry because we got your back. Our good friend Richard Tanner (writer of the ever popular, “Hitchhikers Guide to the Macintosh” series) has put together a helpful “Beginners Guide to iTunes” (PDF ~2.1MB). This is the perfect companion for any new iPod owner who needs a little help getting started with iTunes 7. The well organized 16 page guide is in a printable PDF format and includes helpful full color screenshots to guide a new user through all aspects of using iTunes. Now, Richard is from the UK so the guide (and some language) does skew slightly toward the other side of the pond, but the concepts taught are all solid and should translate regardless of your geographic location. I hope you find it helpful and a big thanks to Richard for taking the time for sharing this with the community. In a series of posts, I’ll be exploring the past, present and future of Apple’s wireless networking strategy, from 1999 to the impact of Apple’s newest Atheros-based Airport cards in the latest Core 2 Duo Macs, and what it means for compatibility and performance in the short and long term. I’ll also be detailing some Airport tips and tricks, as well as covering security, setups, and troubleshooting strategies. After 7 years, Apple’s wireless Internet and networking solution, Airport, has come a long way, as has the rest of the wireless industry when it comes to networking and internet sharing. Parallels Desktop for Mac, the popular choice for virtualization on your Mac has a new beta version available for download now. Beta 2 (3084) has several changes, including partial support for USB 2.0 devices. Parallels Desktop for Mac costs $79, and the beta version is available for registered users who want to give it a try. This new beta version builds on the functionality of the recent (3036) release, with improved and new features. USB 2.0 support is now provided for devices including hard disk drives, printers and scanners, (which work at full native speeds!). Parallels advises that â€œisochronous devicesâ€ like Bluetooth peripherals and webcams do not yet work, but theyâ€™re working on the issue, and we can expect that at some point soon, they will. You can now burn CDs and DVDs directly in Parallels virtual machines, and play any copy-protected CD or DVD just as you would on a â€œrealâ€ PC. This is a major improvement over the existing capability of virtual optical drives. Additionally, improvements have been made to â€œCoherenceâ€ mode. â€œCoherenceâ€ lets Parallels run Windows applications from the Mac OS X Dock, and integrates the Windows desktop into Mac OS X, blurring the line between Mac OS X and Windows. With beta 2, users can place Windows apps on the Mac desktop or in the application dock; use command+tab to cycle through Windows and Mac applications and use Coherence in either Windows XP or Windows Vista. Thereâ€™s better support for using Boot Camp partitions in Parallels Desktop, full support for both FAT32 and NTFS partitions, easier offline configuration, and other changes. Users who continue to utilize a Boot Camp partition will also appreciate the lack of having to â€œre-activateâ€ Windows each time you switch between Boot Camp and Parallels. Activate Windows only once and work in both environments. The install guides and transporter tools continue to become improved and easier to navigate, as well as other features. Users can appreciate the speed of development in this software, and the overall stability of Parallels in beta form. My initial testing of this beta has been promising, but I have as yet not tried any USB 2.0 devices, or disc burning. Any MacCast readers/listeners that try the new features, please leave a comment and tell us what you think. A podcast about all things Macintosh. For Mac geeks, by Mac geeks. Special edition of the MacCast. I was lucky enough to secure an interview with c|net’s podcast diva Veronica Belmont. She took time from her busy schedule to talk with us about her recent nomination by Maccast listeners to become the successor to Justin Long as the next “Mac Guy”. In addition, we discuss her passion for Macs, gadgets, technology and gaming. I ask her how she got into all this tech stuff any way, and we talk in general about women in technology. Of course we finish it up by taking a look inside Veronica’s Applications folder and pull out some of her essential Mac apps. I also asked her about what she has going on in the new year. It was a great interview and I want to thank Veronica for agreeing to come on. ShapeShifer developer Jason Harris has brought together a team of Mac Cocoa programmers for a 3-day event of extreme coding with gifts for the Mac community and for charity. The web site Cocoa Dual has all the details, but in essence the participating developers, including Disco’s Austin Sarner, iClip’s John Casasanta, and VoodooPad’s Gus Mueller, had 3 days to create a holiday themed Mac application. The apps are all available for free download via links on the Cocoa Dual site. In addition, for those truly geeky Mac geeks out there, all the source code for the apps can be downloaded as well. After you download and checkout the apps, you “vote” for your favorite app by making a donation to a charity chosen by the applications developer. The Cocoa Dual web site will then keep track of which app (and charity) garners the most donations and that app will be declared the winner of the “duel”. The competition will run until Dec. 26 at midnight MST when all donations will be tallied. It’s a great idea. We all get seasonal apps from some of our favorite Mac developers and some money is raised for several deserving charities. Now, what about the developers themselves? Well, in addition to the warm feeling of doing a good deed, the developer who’s charity has received the most donations will get a small gift from the other developers in the group. So go grab a couple stocking stuffers for your hard drive and spread some holiday cheer with a donation or two. Heck, there is no rule that says you can’t make more than one donation so why not donate to them all? Happy Holidays. A podcast about all things Macintosh. For Mac geeks, by Mac geeks. Show 171. An iPhone, but not from Apple? Is Apple developing OS X Mobile? Apple addresses Quicktime flaw with security update. Some Apple, iTunes Store and Apple Store updates. Intel to launch another Quad core chip in January. Security researchers target OS X with “Month of Bugs” A new file system makes it’s way into Leopard. Apple makes nice with South Park fans. Could iTunes Gift Card explain “slumping” iTunes sales? A possible fix for iPods not playing purchased music. My procedure for clean installing OS X. Podcaster Meetup at Macworld. Recently, a hack was developed that finally gives Mac users access to the content stored on their TiVo, a service that TiVo had promised but up to now has only allowed to PC users with TiVo-To-Go. I decided to take a look at the latest developments of this hack, for personal playback on my Mac. The original hack is a command-line / Terminal tool, credited to Jeremy Drake and a number of other contributors, dubbed “tivodecode.” From there, a good how-to was written by Dave Zatz, and although it was written well, the method isn’t exactly user-friendly. From there, other folks put together some Automator actions, droplets, etc, but there’s only one that I’ve seen so far that actually works like a Mac app, and that’s TiVoDecode Manager, by David Benesch. Well, true to the predictions on Gizmodo the iPhone was announced today, but it is not the device Apple fans have been waiting for. The iPhone is a new product from Linksys. 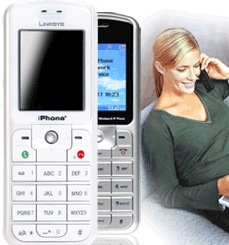 It is a “dual mode” phone that connects to your computer and allows you to make both Voice Over IP (VoIP) calls and standard POTS (Plain Old Telephone System) calls. It offers VOIP integration with both Skype and Yahoo! Messenger Voice and includes other features like information services and multimedia integration. You can search for local business information and make calls directly from results with the push of a button. The integrated media viewer gives you the ability to access music, photos, and streaming video directly from the Internet and see the content right on the iPhone. So while not the Apple iPhone we had envisioned the Linksys version does have some nice features. Now for the proverbial rain on the Mac rumor mongers parade… the Linksys iPhone product page does state that, “iPhone and Linksys are registered trademarks of Cisco Systems, Inc.”, so if Apple does have a phone product ready for launch at Macworld it will obviously not be called an “iPhone”. iTalk anyone?